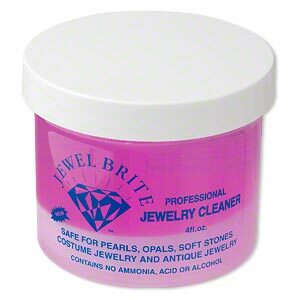 Description - Jewel Brite Cleaner Dip for jewelry, beads and more. Small 4oz jar. Safe, non-toxic and all natural. This amazing cleaner contains 100% biodegradable cleaning agents plus banana and coconut oil. It cleans the cleanest clean and rinses film free; that is why it brings out 100% more sparkle, color and brilliance to your diamonds, cubic zirconias, crystals, rhinestones, and all stones; opals radiate more fire; and pearls impart more luster. It is mild enough for pearls, yet powerful enough to bring back that "brand new look" to all your jewelry. All of your metals will shine, but it will not remove antiquing or oxidizing. It removes undesirable paint from jewelry and eyeglasses. When the cleaner appears unsightly run it through a coffee filter; it doesn't lose strength. Mix half cleaner with half water in a spray bottle for items that can't be immersed such as crystal chandeliers, glued pieces, and rhinestones; just spray and wipe dry.